Supplementary material reads: "From: News Bureau. United Air Lines. Madison 6-8060. 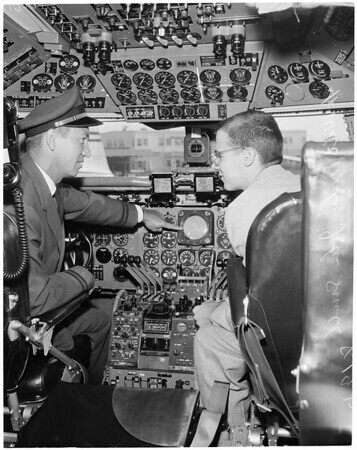 A few pointers-- Seventeen year-old John Smith (right), whose 'sonar' devise won him a $500 scholarship at the recent Los Angeles Science Fair, receives a few tips on C. Band radar from United Air Lines Flight Engineer Walt Friske before departing today (Monday) for the annual Wescon Convention in San Francisco, August 20-23. A graduate of Los Angeles High School, Smith has been choses [sic] from hundreds of other Southland students to exhibit a devise he invented to detect remote objects and determine their distance by sound waves. It will be part of the Future Engineers Show of the convention".